all this happiness: Little Red. You pull off red lipstick so well! I'm pleased to discover that I'm not the only one who lashes on lipstick before bed! Along with effectively all the other makeup that I own. Yikes. As someone who can't really pull off red lipstick - I look much better in browner, earthier tones if I wear lipstick at all - I'm a little jealous of how superb it looks on you. It gives you somewhat of a Snow White effect, with your pale, dark haired looks. Beautiful! This post was such a wonderful read. You are such a fluid writer, every post is so cohesively written - I enjoy reading your blog way too much! Anyways, you look lovely with that shade of red! It looks perfectly applied. I always have trouble applying lipstick that I just never really bother with it at all. despite your uneasy relationship with the color you look beautiful in red, keep wearing it! You're crazy, red is great on you! 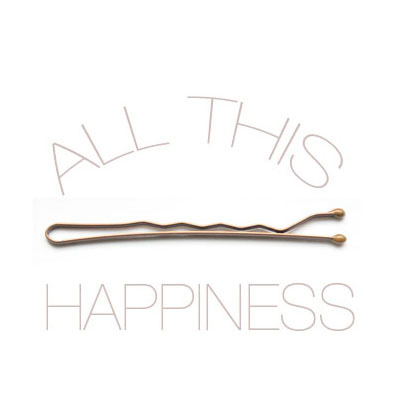 It looks wonderful on you, however! i'm a fan of ruby woo, as well. heard about it via 'rockstar diaries'. for what it's worth, YOU LOOK STUNNING in red lipstick!! i own about a dozen mac lipsticks, a lot of them are in various shades of red. but, thanks to Lulu Letty, i learned about Revlon's matte lipsticks. she raved about it on her blog and since i'm not a big fan of drugstore cosmetics (they tend to leave a strong scent), i fell skeptical. but, i tried it anyway and bought the color, "in the red". Lulu Letty was right -- they're fabulous. I loved it and bought other colors, as well. i now own 4 shades of Revlon's matte lipsticks... two shades of red are noteworthy: "in the red" and "really red". I think red lipstick is great on you, Kater! Red other things, well, I understand about that. I live in the South and in some circles wearing too much red or red shoes or a red accessory can put you in a category where you are considered a tart! I've tried Ruby Woo, Russian Red, but they really did not work at all for me, but you on the other hand do look really really good! I know just what you mean about red and how it sometimes works and sometimes doesn't. I really like this shade of lipstick though, and i think it looks great with your dark hair. I think I'll have to get myself to a mac counter at some point! Also, I'm the same with makeup, I'm always putting it on before I wash my face to go to bed. Best time to practice I say! you look adorable in that shade! i tend to go for the more pink shades in lipstick, but always mac. i bought a blush from them just a week ago, it's so pink it looks like candy. i just want to eat it up! The red lipstick suits well with your skin tones and hair colour. Don't fret too much about wearing it, especially with such ridiculously delicious names like Ruby Woo. I can picture that as a block colour, it may be a little overpowering especially if you don't like the colour to begin with. I'm not like that, I adore red, especially on clothes and adore red lipstick as well, althougj i don't wear it often. Anyway you red lipstick suits you very well. Red lipstick on you gives your skin a beautiful effect like porcelain...definitely continue wearing it!!! As for me, I have 8 tubes of red lipstick - just counted...love to wear it but feel it is very overpowering at my day job - high school English teacher. If I'm not wearing red lipstick, it is a shimmery, muted color like champagne or platinum. As far as clothing and red...only in the form of accessories (making a minimal statement) or for costume! Red in decorating - I agree - covers of books and couches are fine - too much and the place would look like a bordello! me too! i keep telling myself i'm going to try and wear red lipstick more, but its just so much effort! i love the colour red. i think red suits everyone and is quite a powerful colour. i read somewhere that they did an experiment of 2 teams in a competition, one wore red and the other wore black. the winner was voted for and the red team nearly always won through votes. it's also a very good colour to wear to job interviews or on dates - men are more likely to offer to pay for the whole date if a girl wears red! so yay - wear read more! it really suits you. Ruby Woo is the best lipstick of all time, its all I ever wear. Mac do the best lip colours, this shade is beautiful! I discovered ruby woo the other day and really want to buy it, just not sure if I can justify the price. Applying lipstick is so much fun. Red is picky but yo wear it well, I'm still attempting to figure out how to wear red lipstick. 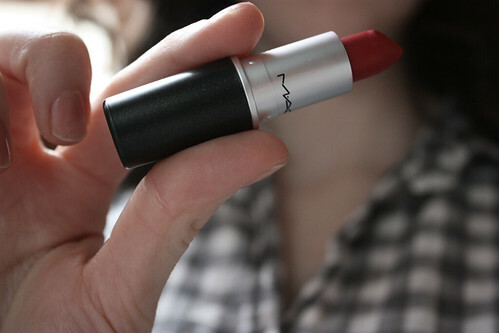 this seems to be the most popular red, perhaps it's time I go to mac and try it out. i'm self-conscious about my lips because they are full ... when i was younger i got called donkey lips! :( so i'm not sure i can pull off red lipstick simply because i lack the confidence. however, i love love love it on you! it really complements your ivory skin! I would strongly suggest going and getting "MAC Red" Lipstick at MAC. It is a perfect shade of red, and doesn't feel as cartoon-y as some of the others because of a slight hint of pink. Wear it with confidence girl! You mentioned having "tiny" lips and that it makes you feel self-conscious while wearing red... I have the exact opposite problem! Because my lips are fairly prominent to begin with, I feel clownish when I wear red lippie. I think it looks very classy and right on you. RED LIPSTICK! WHAT A CLASSIC!!! PERFECT FOR ALL THE OUTFITS! LOVE IT! Wow thanks for the help! Bodyshop is probably a lot less pricey too... MAC is often a bit dissapointing, I'm finding that with my current foundation. You look beautiful with red lipstick. You look so gorgeous! :) I do love the red lip and minimal makeup look; it's so fresh. Oh I LOVE this on you! It's perfect. I'd love to get more comfortable wearing red lipstick. I always feel so weird when I wear it, like it's smudged across half of my face and people are staring or something! I still haven't tried Mac because it's too expensive. I think red lipstick looks great on you. Unlike you, red is pretty much my favourite colour to wear. Red ribbons, red blouses, red skirts, red nails, red shoes...I've yet to wear an entirely red outfit but I would if I had all the right shades. i find lipstick so hard. in high school, i was obsessed with marilyn monroe and loved to wear bright red lipstick and black eyeliner to school. now that i've pared my makeup routine down to just mascara, i don't know if i can pull it off! but you pull it off very well, my dear, and i think you may have inspired me to give it another go. You look gorgeous! I wish I could pull of red lipstick so well! I love this color. There's also another red called Vegas I that I adore. Do you use Stila poppy on your cheeks as well? I'm intrigued. Seen the product but never used it! I love red but I'm always paranoid of having a big red smear on my teeth. Oof! I think it looks lovely on you. This reminds me i have been saving images of ladies with red lippies for a post....curious what colors of red people like to wear! you look so pretty! i am on the hunt for a good red lipstick, but it is not easy! I totally agrre with this! I'm the same way! Hey, I follow your blog for some time now ... If I were a boy, I would fall in love with you - but I guess I'm not. In fact, I'm even married. Just started my own blog a few days ago - will you have a look at it? you should certainly wear red more often. it's your colour. i also love the Mac matte lipstics! my red is Danger Girrrl! My gripe with red lipstick, is that one must have perfectly shaped bow lips to look lovely in it. You do. haha, I do exactly the same thing with makeup! I almost never have the guts to wear it in public but have tons of fun playing with it at night, just before I wash it all off. You pull off red lips perfectly - a fabulous shade for you. I have been eyeing up MAC for a while but am not quite sure exactly which red is "my" red. just came across your blog and love it. thanks for sharing your thoughts!